Perfect for throwing in a backpacking kit (or hunting or fishing kit), the miniscule and nearly weightless Redi-Edge Dog Tag P38 from Klawhorn Industries (http://www.klawhorn.com) is a skimmed-down knife sharpener shaped like a military dog tag. It’s about 2 inches long and has a tether-ready hole if you’re inclined to wear your knife sharpener on your neck like Rambo. 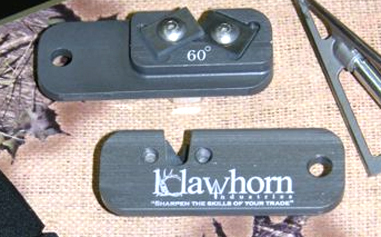 Looks like you can sharpen arrows with it too for deer hunting (though maybe don’t expect me to shoot one). In my tests it didn’t give the finest edge possible, and it took a few pulls through to start making progress on a dull blade, but I’m kind of a sucker for any product this small and efficient. It worked fine for what it is. Not as well as the Füritechnics “magic fingers” sharpener, however. Maybe throw a Redi-Edge in a survival kit, or in the trunk of your car. It’d fit in a tackle box too, though I’ll have to consult a higher authority to see if the Redi-Edge Dog Tag P38 can work a fine enough edge for a fillet knife.